The vov above. There are poskim who passel the vov above and say it's a shinuy tzura (pey pshutah). 1) kosher as is (but fix a bit by adding ink)? 4) lf shailos tinok, do you cover the other letters? "However, it is very difficult to accept with certainty and finality "פסולים" of these kinds without really seeing them." 2. Would you please share with as the Poskim who passel the vov above. Most of todays poskim who are machmir base it on the above. Rav Y.M. Stern seems to imply possul based on the above in his sefer משנת הסופר (see page 51 and the footnote 66. Granted his picture had a thicker nekudah but אין שיעור בעובי האות so some say makes no difference how thick, and he himself is known to passel even when thinner. 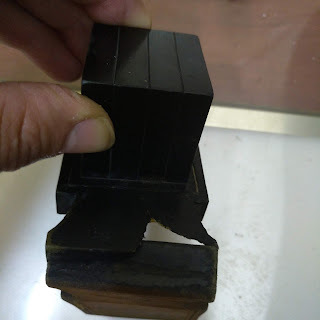 Some poskim say even if it doesn't have a protrusion going in like a pey it is possul (ie not as bad as my picture above, just a line going down ie a shailo of pay with "kav moshuch". You can see this brought down in sefer כתיבה תמה page 175 look at footnote 3. He says poskim passel such a tzurah (again, his picture not as bad am mine so certainly i would think they would passel mine above). Personally I feel this is too machmir but he has such a psak from "אחד מגדולי הוראה שליט"א"
I personally know Rav Friedlander ז"ל of the badatz yerushalayim and mishmeres stam passeled in simillar cases as well, as I'm sure those who did shimush by him could verify. He was known to be more machmir on this issue than rav stern and the poskim in benai brak. Don’t think that his description would at all apply to your case. 1. That first you need to verify that the Tinok if familiar with this script. 2. בשאלה זו אין להחליט לבד בלי מורה הוראה מומחה, דבקל אפשר ליכשל להכשיר הפסול, ולפסול הכשר. 3. There is no need to cover the letters around. What is the Sefer כתיבה תמה that your referring to? Since the one I have doesn’t contain 175 pages. p.s. I take for granted that it’s known and understood that we’re not using a picture, on a screen and enlarged to judge a letter in STa”M. I am familliar with the חתם סופר and if you read what I wrote, when I brought it down, I said the poskim who passel *base* it on that tshuvah. I did not say it is exactly the same case. Sorry if you misunderstood. You asked me which poskim passel, I answered Rav Stern and Rav Freidlander, both whom I know have made an issue from cases similar to my picture. In some instances they passeled, in some instances they said ש"ת. Rav STERN holds פשוט that its פסול if it has the צורה of a mini pey pshuta. 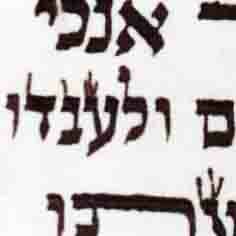 He only says ש"ת when more ambiguous, like if the nekudah is curved or just a dot. Here it is at right angles and long, which is more serious. Rav Freidlander passeled 2 cases for me over the years, not dissimilar to this. ה when I am back in the office on Monday. I personally paskened shailos tinok in this case (without covering) and that us also the psak I received from Rav Vainer. What would be the point of covering on both sides only? If its to acommodate those who say it's so the tinok does not get biased by the size (he knows a pey is bigger), then wouldn't you cover above and below as well (by making a window as many are accustomed? If a tinok is asked (I'm not saying one may) you must cover the Hei that follows because it's a shaila of a sofis letter and by not covering it, a child may know it's not a peh pshuta by the fact it'sin the middle of the word. I'm not sure why the previous letters of the Shem would need covering. The words on the line previous to the word containing the letter in question is a machlokes if they're covered and I asume we're all familair with the psak of the MB. A moreh horaah, talmid of Rav Friedlander, finds it difficult to be machshir based on the full/first image. The matter was concluded after showing a tinok who read it as a vov. 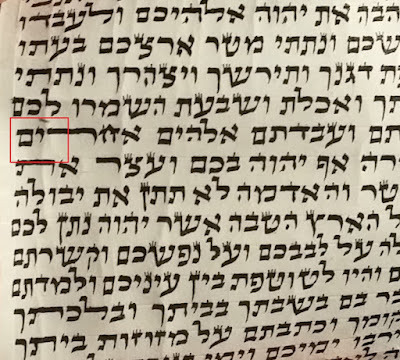 It was fixed by adding ink (scraping would be mechikas Hashem).